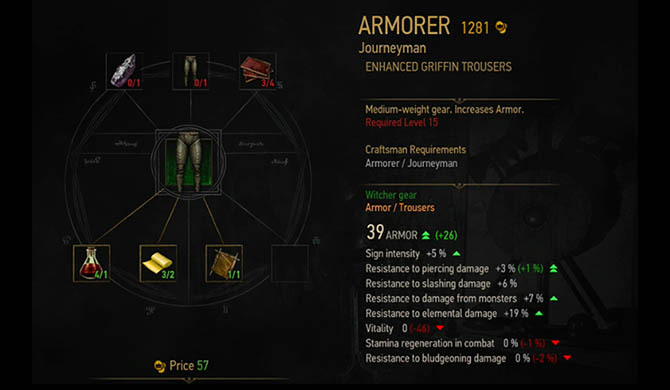 Of all the gear in the Witcher 3, the four Witcher schools offer the best selection of top tier armour and weapons. Starting from Viper and working up to Bear, the school gear varies not only in strength but in many other ways as well. In this post I'll be covering the differences between the top tiers to help you understand a little more. Players who followed my other walkthroughs will know that the Scavenger Hunts start with the Viper School gear which takes place in the tranquil setting of White Orchard. 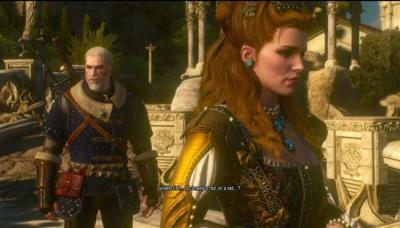 Then moving onto progressively harder quests for Griffin and Cat which test your skills in the areas of Velen and Novigrad. Finally the last quest takes us on a trip to the Skellige Islands for the toughest of the four Treasure Hunts to claim the Bear school gear. Now that I've had a chance to compare the different sets, let's explore what each has to offer. Note: For the purpose of high tier gear I've left Viper out of this comparison for now. It's worth pointing out that all three schools (Griffin, Cat and Bear) share some similarities: they all have equal durability, quality and upgrade slots. You can apply the same number of Runestones and Glyphs, no matter which school type you're using. Of course the slots increase depending on upgrades but they stay consistent across the groups. Now comes the first big difference across the schools. For unupgraded gear the armour protection and base damage vary greatly between Griffin, Cat and Bear. As you upgrade, the difference in ratings across the schools becomes smaller, until you reach the top level upgrade (mastercrafted) at which point the final rating for all schools is the same. This level requirement scales as the gear upgrades. So if you've got a diagram for the Superior version of a piece then you'll also need to meet the requirements for the Superior version which will be different. A good example is the Superior Ursine Chest Armour piece which has a level requirement of 27 - this is 10 levels higher than the standard version! It would be fair to assume that given the difficulty in obtaining a certain set of gear that this would equate to the value of that gear. This is partly true and partly false, because there's also a much bigger picture to consider. This comes in the form of perks or bonuses, with each of the schools excelling in a certain area. A simple example would be the Cat school which offers bonuses to Stamina regeneration and Elemental protection for wearing the armour. Depending on your character preference (Abilities, Signs, Alchemy) you may prefer to use weapons and armour with perks that compliment your characters setup. For example, if you've maxed out your Signs then you'll want fast Stamina generation and would be less concerned with bonuses against slashing damage. Each piece of a school set (chest, gauntlets, trousers, boots) offers a slight variation on the theme, but overall a fully equipped set of the same school will levitate your perks in a certain direction. In general, Griffin armour offers high bonus protection against Monster Damage and moderate protection from Elemental damage. Elemental damage comes in handy when you're up against any of the elemental creatures in the game: Ice Elemental, Fire Elemental, Earth Elemental, Gargoyles and Golems. These creatures typically appear in greater numbers on Skellige and the harder sections of Velen. If you're fighting against Monsters rather than humans then Griffin armour will be favourable early in the game. Griffin swords (both steel and silver) offer bonuses to spells (Signs) and later in the upgrade path (mastercrafted) bonuses to critical damage. The Feline armour set offers players great bonuses to both Stamina and Elemental protection. It's also similar to the Griffin school in the sense that it offers some Monster Damage protection as well. As the name suggests this armour is for a versatile and quick player who likes to combine Signs with melee combat. Casting Signs drains your Stamina bar but with Feline armour you'll have a Stamina bonus giving you the option to cast spells in quicker succession. There are also other skills which consume Stamina including the great Whirl attack (part of the Fast Attack skill tree). Again, using Cat School armour will allow you to use this attack more often. When combined with Feline swords, which have a greater Bleeding Chance, this armour makes for a "snappy" attack setup. Feline Steel and Silver swords come with bonuses for Chance of Bleeding and Buff Chance. Critical Damage bonuses are also rewarded on the upgraded (superior and mastercrafted) versions. The Feline crossbow has a higher attack rating (2.25) compared to the Bear School but has a smaller critical hit bonus (2%). Known as Ursine armour, the Bear School focuses on strong protection against Bludgeoning, Monster Damage and Slash damage in addition to Adrenaline point bonuses. The biggest downfall for Ursine armour is the penalty to Stamina. Unlike the Cat and Griffin school, the Ursine armour offers no additional protection against Elemental damage but is well compensated with its base Armour protection rating and all round melee attack bonuses. 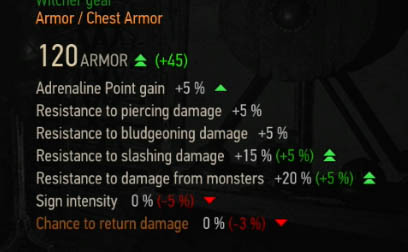 If you like to be slashing away in the middle of an outright assault then Ursine armour offers the best protection in the Witcher 3. The Ursine swords are the strongest swords for melee attacks and that's a fact. They come with bonuses for Focus gain and huge bonuses for Critical Damage (75% for a mastercrafted sword). The Focus gain in particular will enable Adrenaline Points to increase both weapon damage and Sign intensity - so the longer the battle goes on the greater your punishment against the opponent. You can also combine Ursine swords with the skill which grants Adrenaline points at the start of a fight. The final weapon for the Bear school is the crossbow. It's got a slightly lower attack power compared to its Feline counterpart but offers a slight increase to Critical Damage (2%).